Big day today! We’re on the case. We’ll update this post periodically through the day with links and info as the day progresses so check back! MSNBC: Supreme Court upheld the individual mandate as constitutional — but under taxing authority. News media are scrambling to make sense of things. There are more than 800,000 people following the SCOTUS live blog right now. Amazing the role blogging is playing in disseminating news. Here is an ignominious “Dewey Wins” style screw up headline from CNN captured for posterity. President to make a statement at 12:15. You can watch it live at whitehouse.gov/live. ‏We’re making more frequent updates on our Twitter feed. American health care costs more than twice as much as the average for the rest of the economically developed nations making up the Organization for Economic Cooperation and Development (OECD), but our healthcare outcomes are generally worse than the average. We don’t live longer and we’re not healthier than the others. Today’s Supreme Court ruling upholding the Affordable Care and Patient Protection Act (ACA)is a major step forward in reversing our less than enviable world ranking. But it is only a first step. America’s health care tree, now planted, will require frequent attention and pruning. Congress and the States will modify and improve the law just as we have done in Massachusetts. Our Massachusetts healthcare law, passed under Governor Romney and the model for the ACA , envisioned tackling this problem in a two step fashion. First, by making health insurance mandatory for all citizens, and, second, by attacking the high costs. We’ve succeeded with step one. About 98% of all Massachusetts citizens are now insured. Two years ago, we dove into the deep end of the pool to begin the serious work of controlling costs. Since then, we’ve seen improvement, but we still have a long way to go. I’m hopeful that now that SCOTUS has ruled all of us can put our collective shoulder to the healthcare wheel and begin improving our nation’s health and lowering our costs. Jonathan Cohn: Did Roberts Gut the Commerce Clause? Senate Majority Leader Harry Reid, House Speaker John Boehner, House Minority Leader Nancy Pelosi, GOP presidential candidate Mitt Romney and President Obama react to Thursday’s Supreme Court decision on the health law with speeches. Charles Ornstein, ProPublica: Mystery After the Health Care Ruling: Which States Will Refuse Medicaid Expansion? Risk news from the front line – Louise from Colorado Health Insurance Insider posts the 160th Cavalcade Of Risk – Colorado Wildfire Season Edition and as per her signature style, she does a great job hosting. Our thoughts go out to her and everyone in Colorado, who are living out a real-life risk scenario this week. Over 32,000 people were evacuated from the path of the Waldo Canyon Fire near Colorado Springs and the U.S. Air Force Academy on Tuesday night, which is just boggling. There are some dramatic photos on BuzzFeed. You can also follow on Twitter #waldocanyon. Through the first three months of 2012, private sector employers added an additional 678,000 workers (and a total of 847,000 through May). Overall payrolls, the exposure base for workers compensation insurance, now exceeds its pre-crisis peak. During 2011, the unemployment rate ranged from a high of 9.2 percent in June to a low of 8.5 percent at year’s end. By March 2012, the unemployment had dropped still further to 8.2 percent. Despite extreme economic pessimism through much of the past two years, including the past several months of 2012, the economy appears to have successfully avoided a much feared and often discussed “double-dip” recession. Although real GDP growth came in at a disappointing 1.9 during the first quarter, economic growth is projected to reach 2.1 percent for full-year 2012 and 2.4 percent in 2013, according to Blue Chip Economic Indicators. Extreme heat – FEMA / Ready.gov has issued before and during tip sheets on extreme heat in anticipation of the record-breaking temps that are expected to grip much of the country. The National Weather Service Warnings is a handy page to bookmark. The CDC offers Warning Signs and Symptoms of Heat-Related Illness, or see Medline for heat-illness information in multiple languages. PTSD – Today is PTSD Awareness Day and the National Institute of Mental health is an excellent resource. Also see that National Center for PTSD, which offers resources for veterans, their family members, and others who have gone through trauma and suffer from PTSD. Managed Care in Work Comp: Worth the Cost? Joe Paduda waited until the very last minute this week to see if we would get a decision before releasing this week’s Health Wonk Review, but looks like we will all be held in suspense for a few more days! But never fear, our healthcare policy pundits still have a lot to say and Joe does a find job presenting it. Go visit his Health Wonk Review isn’t waiting for the Supremes… – and he’ll probably have an addendum next week when word comes down from on high! The deceased: a police officer. A nurse in training. The perpetrators: A prison guard. A surgeon. These recent deaths were two of the approximately 5,000 on-the-job fatalities that occur each year, and both both were related to domestic violence. We mention the professions of the parties involved simply because domestic violence is often assumed to be an issue that doesn’t happen to “people like me” or that it primarily occurs in certain economic strata. These myths and stereotypes are part of the reason that it can be such a hidden problem. In the case of Officer Kevin Ambrose, a 36-year veteran of the Springfield MA police department, he was shot and killed in the line of duty while protecting Charlene Miller and her baby from a former boyfriend. Miller was also shot but survived; Miller’s baby was unharmed, largely thanks to Officer Ambrose’s courage. The assailant, Shawn Bryan, a Rikers Island corrections officer, took his own life after the shooting. Last week, Jacqueline Wisniewski was stalked and gunned down in Buffalo Hospital. Her murderer was a surgeon at the hospital, her coworker and a former boyfriend. The hospital and nearby schools were locked down for a few hours after the incident because it was unclear if this was a targeted incident or a shooting spree. Timothy Jorden, a trauma surgeon at the hospital and a former army Special Forces weapons expert, was identified as the assailant by witnesses and an all points bulletin was issued. He was found dead at his home two days later. These tragic events are part of a phenomena called “domestic abuse” or “domestic violence” – misleading terms at best. The word “domestic” softens the edges of a brutal reality, and implies that it is something that happens behind closed doors, not our business. Yet it is indeed something we should be making our business and it is clearly not something that is confined to the home. Increasingly, the violence plays out or culminates in the workplace as assailants are stalked; it also takes the lives of working police officers and first responders. According to a recent report in the Annals of Epidemiology, homicide is a leading cause of occupational death in U.S. women. There were 142 homicides among women at work resulting from intimate partner violence from 2003 to 2008. While the rate of homicides in the workplace has been trending down, the percentage of homicides against women at work increased in 2010 to 13 percent. Those at highest risk were in the health care, production, and office/administration professions. More than half the homicides occurred in parking lots and public buildings. Criminal outsiders, which includes robberies, rapes, and random violence by strangers. This type of violence is common in organizations that handle money, financial transactions, and drugs. Risk mitigation can include staff training and addressing environmental issues such as better lighting, customer/worker barriers, lockboxes, alarms, and closed circuit videos. Organizational clients – this is violence committed by customers, patients, or other recipients of the business services. Healthcare workers in particular suffer many incidents at the hands of patients and family members. These might include rage-related incidents and incidents related to mental health issues or persons under the influence. Risk mitigation measureless include staff training and environmental controls. Lateral or worker on worker violence, which includes the so called “going postal” incidents and retribution for firings or other work-related issues. Although these incidents are the ones that make the headlines, they are the least common. Mitigation measures include better hiring practices, such as background and reference checks, zero tolerance policies that are enforced (including anti-bullying measures), manager and supervisor training, anger and stress management training for workers, availability of an EAP. Particular measures may need to be taken at points of high stress, such as layoffs or job loss. Domestic violence – this involves an employee involved with a spouse or significant other; it also includes coworkers who might be coincidentally caught up in events or first responders who are injured when trying to help the victims. This is the most difficult one to address since it stays “underground” until a serious point of escalation. The best way to deal with this potential is proactively as part of an organization’s health and wellness effort by publicizing the issue and publicizing the availability of resources to help. More and more progressive companies are addressing the issue. The Corporate Alliance to End Partner Violence is a national nonprofit organization dedicated to partnering with businesses to help reduce the costs and consequences of partner violence at work. From policies and programs to legal issues and legislation, CAEPV is a credible source for information, materials and advice. It’s an excellent source of best practices for corporate programs to prevent partner violence and offers concrete help for employers in starting a workplace program. Employers are involved in domestic abuse whether they want to be or not. Futures Without Violence delineates Seven Reasons Employers Should Address Domestic Violence not the least of which are that it is a pervasive issue, it poses security and liability issues, and it results in significant lost time and lost productivity. A 2003 CDC study revealed that domestic violence accounts for nearly 8 million lost work days, the equivalent of more than 32,000 full-time jobs. Plus, it is a morale issue. Studies show that 84% of surveyed employees believe that employers should get involved in the solution to the problem of domestic abuse. Yet there is a discrepancy, because at the time of this survey, just 13% of executives surveyed thought it was the company’s job to help solve the problem. Workers’ comp is simply not an issue that can easily be siloed off from other aspects of a workers’ life. 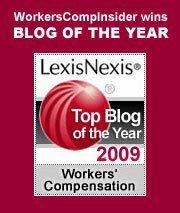 We certainly see that with health issues and so-called lifestyle issues that complicate worker’s comp claims. So, too, with domestic violence. While the employer may or may not be shielded from compensability in incidents of work violence, that sometimes simply opens the door to liability in the courts for other reasons: negligent hiring, lack of security, etc. While it’s important to address the safety issues directly related to the job, it makes economic sense to have health and safety be part of an overarching wellness program that addresses health-related issues that occur both on and off the job. We live in the digital age, with all its conveniences and consequences. It would be hard to imagine a law requiring that all telephone calls be routed through live operators, or limiting maps to those that can be purchased at your neighborhood gas station. But each technological innovation creates a few new jobs and, seemingly, the loss of many others. Which brings us to the continued – and mandated – use of stenographers in virtually every workers comp claim filed in New York. Senator Diane Savino (D-Staten Island) has filed S. 4112, which would certainly help the employment prospects of stenographers in the Empire state. Following an aborted effort by the NY workers comp board to test the use of digital recording in a few of the 300,000 or so annual workers comp hearings, Savino wants to ban digital recording from any comp hearing and require stenographic reports as the sole recognized form of documentation. Her bill, currently under consideration, would make stenographers a permanent fixture in workers comp for years to come. Stenographers and their allies will argue that their presence improves the accuracy of court reporting. There are fewer “inaudibles” in their transcripts. But such accuracy comes at a substantial cost. The wages of a stenographer are in the $50-60K range, plus benefits. The cost of installing digital recording equipment in a courtroom runs less than $20,000, and once installed, the cost of maintenance is minimal. The trade off becomes even more reasonable when you consider that the New York system requires an unprecedented number of hearings for each and every workers comp claim. In contrast to virtually every other non-monopolistic jurisdiction, New York insurers and TPAs are not allowed to make routine, unilateral changes in the status of any claim. A change in claim status requires a hearing, in front of a judge, complete with legal representation on both sides and a stenographer. This is enormously redundant and, in a word, non-sensical. It is also the root of New York’s highest-in-the-country, soon-to-go- higher administrative costs. On a per capita basis, New York has more judges, more bureaucrats, more hearings, more paper flow – and more stenographers – than any other competitive state. The fundamental goals of reasonable reform in New York can be easily stated: improve benefits for injured workers and lower the exorbitant cost of insurance for employers. It is not difficult to imagine how this can be done: simply look at the way most other competitive states manage workers comp claims. New York would have to streamline its entire system: instead of operating like a monopolistic state, micro-managing every claim, New York could empower insurers and TPAs to manage claims as skillfully and independently as they do in other states; by doing away with unnecessary hearings and hugely redundant reviews of literally millions of forms, New York could substantially reduce staffing levels at the Workers Comp Board. But efficiency comes at a cost. One person’s cost savings is another’s job loss. These needed reforms would eliminate many, many jobs – and in doing so, would throw hundreds of loyal workers into the already burgeoning unemployment lines. In this one small example, the elimination of stenographers from hearings would lower administrative costs, even as it would increase the unemployment of people with potentially obsolete skills. This is not an easy trade off, but a necessary one. At some point, New York has to look at the big picture: workers comp is way too expensive, even though the benefits, for the most part, are mediocre. Every adjustment to the current statute, every administrative decision, should pass through a single filter: does this improve the benefits to injured workers and does it reduce the cost to employers? When you run Senator Savino’s S. 4112 through this filter, it’s not part of the solution, but just another clog in an already overloaded drain. Wallace Weatherholt, AKA Captain Wally, was leading a family on an air-boat tour of the Everglades. To liven things up, the 63 year old captain apparently dangled some food over the side of the boat. An alligator obligingly leapt out of the water to consume the (illegal) snack and took off Wally’s hand in the process. To the gator, the hand was part of the snack – and who could argue with that? Unfortunately for the gator, authorities killed it to retrieve the hand, although doctors were unable to reattach it. The issue here is compensability: Captain Wally was clearly injured “in the course and scope of employment” – but is this a compensable injury? Did Captain Wally cross the line to “wilful intent” and thus disqualify himself from workers comp benefits (which, by the way, will be substantial, given the severity of the injury and the permanent loss of a hand)? – Did Captain Wally’s employer have a written policy against feeding alligators? – Was the enforcement documented? Were their punitive consequences for the act? – Has Captain Wally’s unsafe practice been observed in the past and if so, what was done about it? If Captain Wally’s employer turned a blind eye to this practice, which, parenthetically, was good for business, the employer and the insurer will own the injury. Unless the prohibition is an explicit condition of employment, in all likelihood the employer will be on the hook for the loss. As for Captain Wally, he, too, will be on a hook of a different sort: he will have a permanent reminder of his ill-advised and illegal feeding of a primitive creature who was minding his own business until an attractive snack caught his impassive eye. I do feel for Captain Wally, but hands down, my greater sympathies are with the gator.